If you are an employee working under a difficult and extremely tantalizing boss then you can be rest assured that you are not the only one who is at the receiving end of such tantrums. Almost all employees across the globe face the same dilemma on a daily basis. Though it may seem like you are experiencing a living hell on a daily basis, yet here is a list of some of the positives and good things to learn from a bad boss. Having a bad boss really teaches one to work hard so as to try your level best to impress him or her. Though it may seem that you never receive your dues for all the hard work, you should remember that hard work always pays off and sooner or later when you least expect it you will be rewarded. As long as you work hard, no matter how bad your boss is he or she will not be able to fire you, under any circumstances. Having a strict task master as a boss could really keep you on your toes at all costs, such that under all circumstances you become accustomed to giving up top notch work. Chances are that if you have an easy going boss who is alright with anything then eventually your standards start dropping and you do not give your one hundred percent. So as bad as things might seem, at the end of the day something good does come of it! Over time, if you have a bad and demanding boss you will learn to bring your ‘A- Game’ at all times. No matter how good your previous project of presentation was, the next time you will try even harder to outdo your earlier brilliant work. So instead of wasting time grumbling of what a bad boss you have think about it this way, that over time, you will be able to better yourself as well as the quality of work you submit. Having to deal with a trying personality can be extremely challenging and initially you will find that no matter what you do, you will be unable to please him. As time passes by you will become an extremely good listener who will be able to carry out any instruction to perfection. In this technological age companies like to employ individuals who understand instructions quick so your ‘bad boss ‘will surely help you become a more attentive listener. When you have the experience of working with a bad boss then you learn to become extremely perceptive as well as you develop the ability to foresee problems. In order to avoid displeasing your boss you will try to stay one step ahead at all times and under all circumstances. This is indeed a positive trait that not all are blessed with and can be developed when you work in an extremely competitive environment with a bad boss. When you work with a bad boss who is unwilling to be happy with anything you do, one good thing which you learn over time is to work in an altruistic and unobtrusive manner without expecting any reward or credit in return. Initially this might hurt a bit and make you feel let down, but over time you learn to keep your emotions at bay and you will learn a lesson that you can remember throughout your life, that having expectations often lead to disappointment. One good thing you can learn from having a bad boss is the concept of team spirit and unity. When everyone working in an office or company knows that the boss is a bad one then the colleagues gradually begin to stick together so that no one person has to take the fall. Irrespective of no matter what happens, the team ensures that they have each others back at all times so that no one is targeting specifically by the boss. Working with a bad boss is a job that could eventually give you a lot of stress initially however over time one positive quality that you might be able to develop in the bargain is the ability to work irrespective of how toxic your environment is. So irrespective of whether your boss is shouting , throwing a tantrum , being difficult or unreasonable you learn to turn a deaf ear to it and concentrate as well as focus solely on the task at hand. One of the main good things that come out of working with a bad boss is that you learn to put forth your views irrespective of whether your views are in consonance with that of your boss. Initially you might be scared to say anything different or unconventional however gradually you realize that you should put forth your views at all costs otherwise you might be branded as a spineless individual who does not have the ability to air his or her views. Having a bad boss who is intolerable when anything goes wrong or when he is one of his ‘moods ‘will surely teach you to act decorous at all times so that nothing you do will be able to unnecessarily set him off. You will be constantly ensuring that at no part of the day you are behaving in an inappropriate and unprofessional manner. Rather you make sure that you never act in an improper way. When you work under a bad boss, you make sure that you are being politically correct at all times so that you cannot be hauled up for saying something improper or inappropriate. This does not imply that you become sly or untrustworthy like, say most politicians, rather you speak no unnecessary words and make sure you think twice before you blurt out anything, which you ought not to be saying that might get you in trouble. Documenting does not imply that you film whatever is happening at your office, rather since your boss is such a bad or untrustworthy individual, you learn to keep track of what he or she is saying and make sure that for every task that you are being made to do, you get it down in writing and make sure he or she stamps and signs it, so that there are no complications in the future. This is a very good habit, though time consuming, it will help you in the long run. When you have a bad boss you automatically learn to accept your mistakes over time without trying to defend yourself as you learn that you are talking to someone who is rather unreasonable as well as difficult. If you worked with an easy going individual who pointed out your mistakes chances are that you would spend a good deal of your time trying to prove that you are correct irrespective of the fact whether you were actually in the right or not. Working in an office where the boss is extremely difficult could really teach you to develop thick skin where anything said to you will not be taken personally. You realize that since this is a professional environment whatever is being said is not said out of malice. Your boss no matter how bad has the interests of the company and employees at heart wouldn’t be in that high position without having deserved to be there. One good thing that can be learnt from working under a bad boss is that you learn to look beyond a person’s mannerisms and behavior and start to appreciate him or her for his inner qualities and talents. Even though your boss may be a bad boss to you, yet there may be several valuable things which you can learn from him or her. Like the quality of leadership, hard work, dedication, commitment and perseverance. 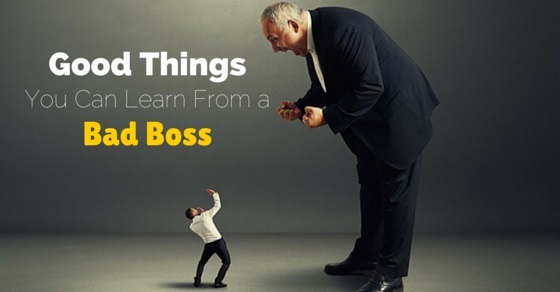 So these are some of the good things that you can learn from having a bad boss. Things might seem tough but remember your boss maybe like this because he or she is under extreme stress. However over time if you realize that things have gotten too out of hand then don’t forget to stand up for yourself and hand in your resignation. You deserve to work somewhere where your hard work and dedication can be appreciated. Previous articleWork Assignments During the Interview Process: What to do? Next articleHow to Make a Good Impression on the First day?